This entry was posted in 1980s, Homicide, L.A. Times, LAPD and tagged 1980, 1981, Andre Gilcrest, Anthony Freeman, Carletha Stewart, Daryl Gates, Franklin Freeman, Ismael Luna, Madelynn Kopple, Michael Malloy, Orasteen Freeman, Rhonda Robinson, Ricky Sanders, Roosevelt Robinson, Rosa Robinson, Soledad Prison, Tami Rogoway, Tehachapi prison by Deranged. Bookmark the permalink. Hello, Where is the conclusion of this? I just found your site and am already enjoying it! So crazy, I lived on Corning st, up the block from the shopping center the Big Boys was located in. I was in this Big Boys earlier that evening at around 6pm. I remember seeing the yellow tape as I passed the restaurant going to church that Sunday morning. Wow, that’s a little too close for comfort! It was a brutal crime. The crime was so horrendous. I’m not surprised that people picked up a spooky vibe from the place. What a horrible experience. I fell for the families who suffered during this tragedy. 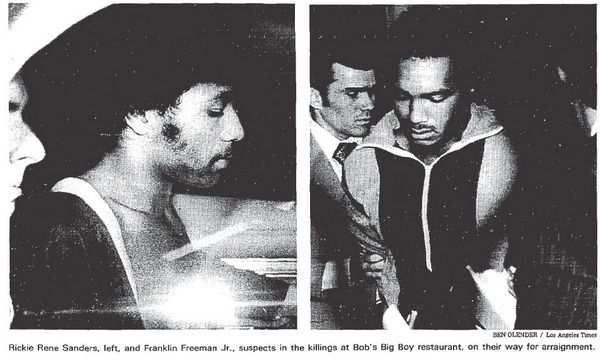 However my brother Franklin Freeman Jr. Has been in prison for over 37 years and had absolutely had nothing to do with the crime. What a tragedy in and of itself. The real murderer has been free for 37 years and we call this justice!!!!!! Wow I heard about this through the family when the trial took place my cousin didn’t get a fair trial and so much was not entered in the trial on his behalf.. It was such a brutal crime. It’s no wonder your memory of it is clear. It’s funny how time can make you think about the past. All of a sudden, I thought to myself what happened with carletha stewart and looked it up. I was amazed to see this article. I used to work for Bob’s Big Boy at that time and knew Carletha; in fact I just left the night shift and went to the day shift. I had no idea that there was going to be a robbery, I just thank God that he moved me because I could have been one of the four that lost their life. The funny thing about this is that after the incident I heard that Carletha was after Rodell who use to be the manager there and he was the reason she no longer worked there. There was a lot of animosity between the two. What really hurt me the most was Cesario the bus boy; the only reason he was there was because the buses were not running when he gets off so he would stay the night until the buses starting running again. I was so fond of Cesario, I would even give him some of my tips. It still hurts now after all these years that those innocent people were hurt needlessly. I search the past sometimes too–I’m not always sure what triggers my interest. I’m fortunate that I never experienced what you did. It is truly frightening. Your memories of Cesario are touching. He sounds like he was a sweet guy. I don’t think I’ll ever understand how people can be so unspeakably cruel. Thank you for writing. Take care and be safe. Does anyone have a link or actually have the video from America’s Most Wanted: America Fights Back Season 10, Episode 24? It is the actual episode that covers Bobs Big Boy Massacre with my Mother in Law who is a survivor Rhonda Robinson. Levi, I searched but had no luck in locating that particular episode. I have found descriptions of the episode but no links to view it. my best wishes to your mother-in-law. 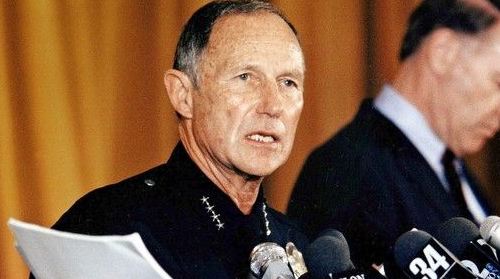 I was contacted by the Police Department at the David Brotman Hospital on Life Support next to the last Week in July 1978 and asked by the Los Angeles Police Department where my 12 Gage Pump Shotgun was. It was purchased at the Western Surplus in the first week of July 1978. Next to the Last Week of July 1978 I was laid on the Floor in a Business when TWO Animals came into the Location and Shot me in the Back FIVE times with a 357 Revolver, they took the Pump Shotgun with them in what they wanted it to appear as a Robbery, later to discover they were sent by some one I knew. The Shotgun that was left behind was the one I purchased according to the Police, but shown in this series it was Super Modified to where it does not look like a 12 Gauge Shotgun. One Question never answered, Why were the Police asking about the Shotgun within a Moth after it was purchased? Then why was only it left at the Bob’s Big Boy Scene almost TWO (2) Years later. Where was it all that time and why not leave the other Shotgun?